A VPN can open a whole load of extra services and content on your Android TV box while keeping your streaming private from snooping eyes. We take a look at the best VPNs for Android TV boxes that guard your privacy and unblock geographically restricted content without destroying your internet speed. Android TV boxes are plug-and-play alternatives to media center software like Kodi or Plex. Because they don’t require much configuration, they’re ideal for people who don’t have the confidence, skills, or time to set up a traditional media hub. Further, as Android is a free, open-source operating system, the hardware is usually fairly inexpensive. When you buy an Android TV box, you’ll find that it comes with numerous video apps installed. The problem is that these apps often geo-lock their content. This means they’re only accessible from a particular country or region. For instance, if you live in the US, you won’t be able to watch TV shows on the BBC iPlayer. You can resolve this problem by connecting to a virtual private network (VPN). VPNs encrypt your network traffic and route it through a server in a different location. To any outside observers, your traffic now appears to be coming from the region the server is in. Better still, your encrypted data cannot be read by anyone without the decryption key. This prevents your ISP from seeing the sites you visit, the content you stream and selling details of your online activities or using them to justify throttling your connection. ExpressVPN: Our top recommendation. Fast with solid security, plus it can unblock tons of streaming sites like Netflix. Includes router support and a smart DNS service if your Android box doesn’t support VPNs. Includes 30-day money-back guarantee. NordVPN: Strong security and fast servers. Can unblock Netflix as well as most other major streaming sites. CyberGhost: No-logs VPN with great security and super fast servers. Unblocks Netflix and other streaming sites. IPVanish: Perfect for Kodi users who need a lightweight, remote-control friendly solution. Strong security and decent speed, but won’t work reliably with Netflix. PrivateVPN: An up-and-comer that’s great for unblocking video streaming sites while providing strong security and good speeds. ExpressVPN is among the best VPNs for streaming HD content thanks to its fast speeds and lack of bandwidth restrictions. It’s also one of the most secure because it uses 256-bit AES encryption (which would take billions of years to brute force) and doesn’t log your IP address or the sites you visit. There’s even a network lock that stops all internet traffic when the connection to the VPN is dropped. ExpressVPN offers servers in more than 90 countries. It can unblock the most popular streaming platforms including Netflix, Amazon Prime Video, HBO, and the iPlayer, despite their best efforts to block VPN users accessing region-locked content. This VPN has apps for Windows, Mac, iOS, Android, Linux, and certain routers. It can also be manually configured to work with Chrome OS, Apple TV, Playstations, and Xbox One. Best VPN for Android TV:ExpressVPN is our top choice. A blazing fast and reliable choice for Android TV boxes. Unblocks all major streaming services including Netflix, Hulu and Amazon Prime. Great privacy features and top security. Try it risk-free with the 30-day money back guarantee. NordVPN offers several different types of server including some optimized for ultra-fast streaming. If you’re interested in watching 4K content on your TV box (assuming your hardware supports it), this is a huge plus. Better yet, NordVPN allows six simultaneous connections on a single account, which is far more generous than most other VPN providers. There’s even live chat customer support in case you run into any problems. It’s no slouch when it comes to security, either. NordVPN uses military-grade encryption that (as of the time of writing) cannot be broken. It doesn’t log any personally identifiable information and its kill switch allows you to block specific applications’ internet access when the connection to the server is lost. NordVPN has apps for Windows, MacOS, Android, and iOS, with browser plugins for Firefox and Chrome. It can be manually installed on Linux-based systems and a decent selection of WiFi routers. BEST BUDGET VPN:NordVPN is a great value choice. A great value option which works well with Android TV boxes. Decent HD streaming speeds. Allows up to 6 simultaneous devices to be connected. Keeps no logs. 30-day money back guarantee. CyberGhost is one of the most security-conscious VPNs available. They don’t keep logs of your browsing history, connection times, or IP address and all traffic is secured with 256-bit encryption. It even includes extra features like a built-in ad-blocker, forced HTTPS redirection, and malware protection so you can ensure you’re protected from the internet’s most common threats and annoyances at all times. The CyberGhost app has specific buttons you can click based on what you’d like to achieve. The most interesting of these to TV box users is the “Unblock Streaming” tile. This allows you to select services like Netflix, Amazon Prime, and Comedy Central from a list, after which, you’ll be connected to a server in the relevant region. While CyberGhost offers fewer locations to choose from than some of its rivals, it has a high number of servers in Europe and the US, where the majority of popular streaming platforms are based. CyberGhost offers apps for Windows, MacOS, iOS, and Android. It can be manually configured to work with Linux and some WiFi routers. GREAT VALUE:CyberGhost is easy to use with a custom app for Android TV. Unblocks popular streaming content. Has fewer server choices than it’s nearest rivals. 45-day money back guarantee. IPVanish is an extremely popular VPN among Kodi users because of its low cost and negligible impact on connection speeds. It owns and maintains most of its servers, allowing it to control every aspect of the network and resolve problems more quickly than most of its competitors. Like ExpressVPN, IPVanish uses 256-bit AES encryption. It also offers a selection of additional security options including a kill switch, regular IP address changes, and OpenVPN obfuscation. IPVanish can’t unblock certain streaming platforms but excels at keeping you protected while using P2P networks and Kodi. It’s perfect for TV box users thanks to its lightweight, easy to use Android app. Further, IPVanish works with every Kodi addon we’ve tested. IPVanish is one of the simplest VPNs to install thanks to its excellent multi-platform support. There are apps for Windows, iOS, Android, and Amazon Fire Stick. It can be manually configured to work on Linux and Linux-based devices like the Raspberry Pi. EASY TO USE:IPVanish is great for families that want to connect multiple devices with a good choice of apps. A favorite with Kodi users that also works well with most Android TV boxes. Could do with 24hour live support. 7-day money back guarantee. PrivateVPN isn’t as well-known as some of the other VPNs we’ve covered, but it punches well above its weight in terms of usability. PrivateVPN is completely logless, uses 256-bit encryption, and has no bandwidth limits whatsoever. While it has just 75 servers spread across 56 countries, it offers above average speeds and has no noticeable buffering when streaming 1080p content. PrivateVPN is capable of unblocking Netflix, BBC iPlayer, and Amazon Prime Video, however, it can’t bypass China’s Great Firewall. The company offers a live chat service during business hours with longer response times at the weekends. With your approval, the support staff can also remotely control your device to solve more difficult problems if necessary. 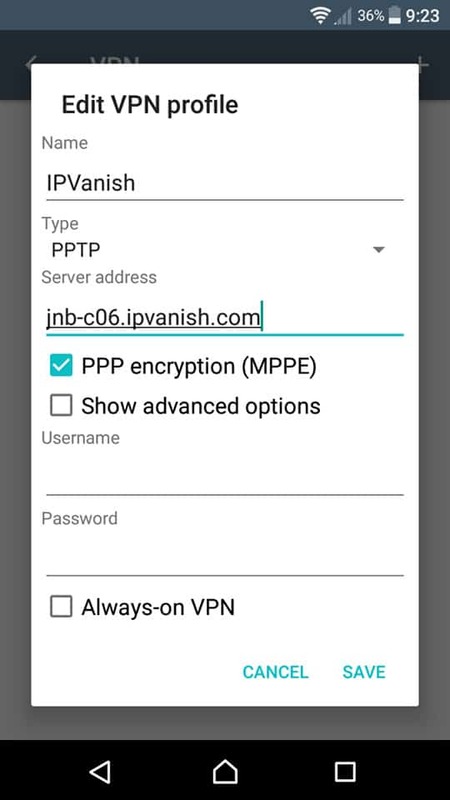 PrivateVPN apps are available for Android, Windows, and iOS. It can be manually installed on MacOS, Linux, and some internet routers. Great Speeds:PrivateVPN is consistently reliable. Works fine with Android TV boxes. Good for general purpose use and Torrenting. Speeds were surprisingly good at this end of the market. We would prefer a 24/7 live support option. 30-day money back guarantee. Can I use a free VPN with an Android TV box? While there are free VPN services available, we advise against using them for several reasons. Firstly, they’re far slower than the VPNs above. Usually, you’ll find it takes a long time to even check your email when connected, let alone stream HD video. Secondly, you have to consider how these VPN providers are making their money. If they’re particularly unscrupulous, there’s nothing stopping them from displaying ads on every site you visit or selling your internet history to third parties. Primarily, people connect to VPNs to keep their browsing private but if you use a free VPN, there’s a chance you’re actually more exposed than ever. Finally, with a free VPN, you open your system up to all kinds of threats. These could be as simple as a VPN client that installs malware on your computer, or as advanced as using your system as part of a botnet. To be safe, we’d recommend sticking to trusted, reputable VPN services with well-detailed privacy policies. 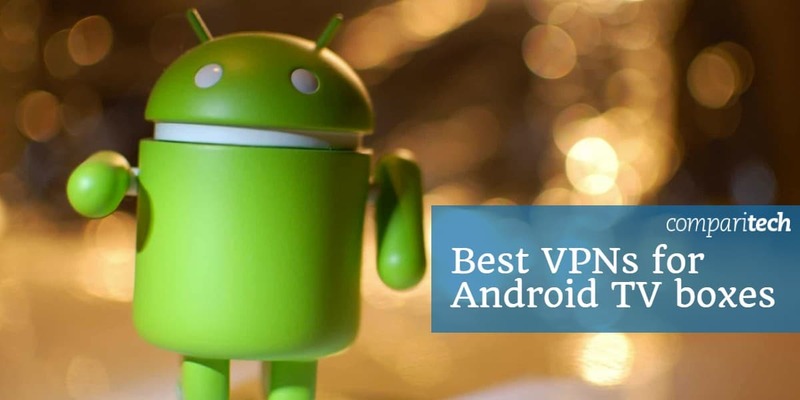 All of the VPNs we’ve covered above have Android apps available in the Google Play Store. Installing them is as simple as registering for an account with a specific provider then searching for the relevant name in the app store. However, you don’t have to worry if you can’t access the app store on your device. 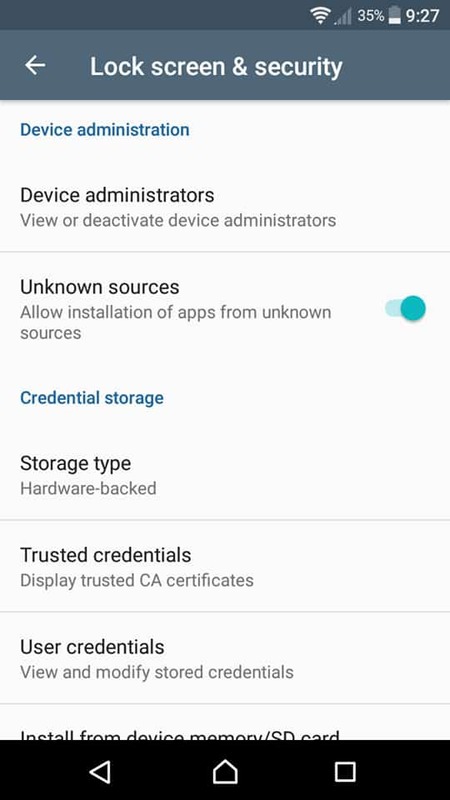 Android also allows you to manually install and configure a VPN. Below, we’ll explain how to do this step-by-step. Essentially, the app store is just an easier way to find and install APK files. If you find the relevant file somewhere else and transfer it to your device, though, it will install in exactly the same way. Bypassing the app store in this way is called “sideloading”. First, go to your VPN provider’s website. On the page where you select your platform, look for a direct link to the APK file under the Android heading. Tap it to begin the download. Before you can install the software, you’ll have to enable installation from unauthorized sources. This feature is intended to protect you from potentially sketchy apps but since we know that this one is safe, there’s no risk. Go to your Settings menu and select the Lock screen and security option. ABout halfway down the page you’ll see the Unknown sources setting — tap it to turn it on. Next, open your device’s file manager app. Navigate to the downloads folder and click on the APK file you just downloaded. After being asked to confirm, the VPN app will begin to install, after which, you can use it. Begin by going to your Settings menu. Now, depending on which version of Android you’re running, the following menu options may be phrased slightly differently but it’s usually fairly easy to tell which you need. In my case, I tapped the More option under the Wireless and networks heading, then chose the VPN option. Tap the + icon in the top-right of the screen. If you haven’t set up a lock screen PIN or password, you’ll be prompted to do this now. Once that’s taken care of, give your VPN connection a name (in this case, I’ve used “IPVanish” but you might want to name it based on the location of the server you’re connecting to). The next step is to enter your VPN’s details. This differs from one provider to another but the relevant information is usually available on the website under their Android setup guide. For streaming video, IPVanish recommends using PPTP, so select that from the list. Next, you’ll need to enter the address of the server you’d like to connect to. Again, you’ll find these on your provider’s site. If you’re struggling to locate the server address list, consider looking at the Linux setup guides since this step is required on that platform as well. Finally, enter your login details in the boxes at the bottom and hit Save. If you’d prefer not to log in manually every time, check the Always-on VPN option first. From here, just tap the connection and if everything has worked, you’ll be connected to the server of your choosing. You can verify that your VPN is working by using an IP address checker to see what region your IP address is linked to. 12 Can I use a free VPN with an Android TV box? 7 Can I use a free VPN with an Android TV box?